Out-of-the-box, Internet Explorer will block so-called "unwanted popups" - these are typically ads that open in a new window, usually without requiring any action on your part. Some not so well engineered websites and web applications are crippled by popup blockers, but they're fortunately in the dwindling minority. So, in most cases, the popup won't interfere with the operation of legitimate websites; unfortunately, some websites now bypass the Internet Explorer popup blocker by opening an ad in a new window when you click somewhere on the page, or start scrolling up or down (because it is an action on your part that generated the command to open a popup, IE's popup blocker allows the popup to load). 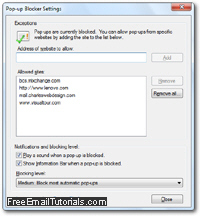 This tutorial shows you how to block all popups in Internet Explorer; and the next tutorial explains how to allow popups from a particular website, and you get the best of both worlds! Follow these simple steps to prevent any popup from opening unless you manually override the popup blocker, or have added the website to your list of allowed popups (link in intro). "Medium" is the default setting, which you probably already had configured; instead, choose the first option in the dropdown "High: Block all pop-ups", and Internet Explorer will from this point on block all popups unless you have either added a website to the popup whitelist, or manually allow the popup by holding down the Ctrl and Alt keys on your keyboard, simultaneously, while you click on a link that is supposed to open a new window (and would otherwise remain blocked). Once you have customized your popup blocker settings to prevent any popup window from opening, click on the "Close" button to return to Internet Explorer. Internet Explorer Tip: this is the highest level of protection Internet Explorer offers against popups, and they should become history after this point. But there are some cases, extremely rare though, where a popup will still go through - again, very seldom will it happen.